Buddy came to us in early July 2015 as he had been limping on his right hind leg after he ran to greet his owner one day. Dr. Grubac determined that he had ruptured his ACL (anterior cruciate ligament), which would require surgical repair with an orthopedic specialist. 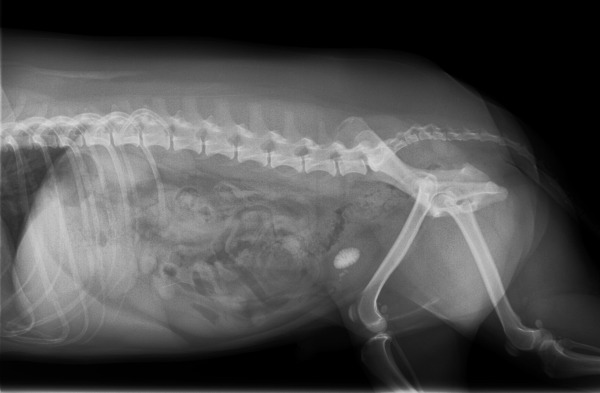 After taking some x-rays, we then discovered that poor Buddy also had bladder stones! The owners decided that it would be best to remove the bladder stones while Buddy was here for the orthopedic surgery. Buddy came back a few days later for his surgeries with Dr. Kahlon. Everything went smoothly and Buddy stayed overnight with us while he recovered. After the surgery, Buddy had some weekly cartrophen injections to help with his joints, and the owners changed his diet to prevent more bladder stones. Now Buddy is doing physio at home with his owners’ help, and they are slowly re-introducing walks and exercise. Buddy after getting his cast removed - feeling much better!